To achieve the best performance from any borehole instrument, you must make sure that the sensor electronics, its casing and the power supply share a common, local ground, and that all power and data lines are adequately protected against lightning and other transients. 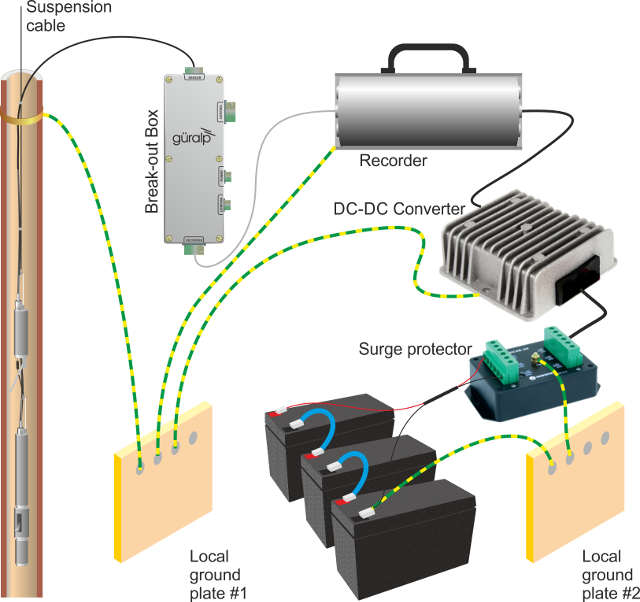 This document describes techniques for grounding sensor equipment which have proved effective in many installations. However, local conditions are always paramount, and you should design your installation with these in mind. Any regulations in force at your chosen location must also be followed. If you are using mains (outlet) power, or some other AC power distribution system, we recommend installing a fully isolating transformer between it and the power supply for the instrument. This will allow full control of the local ground. 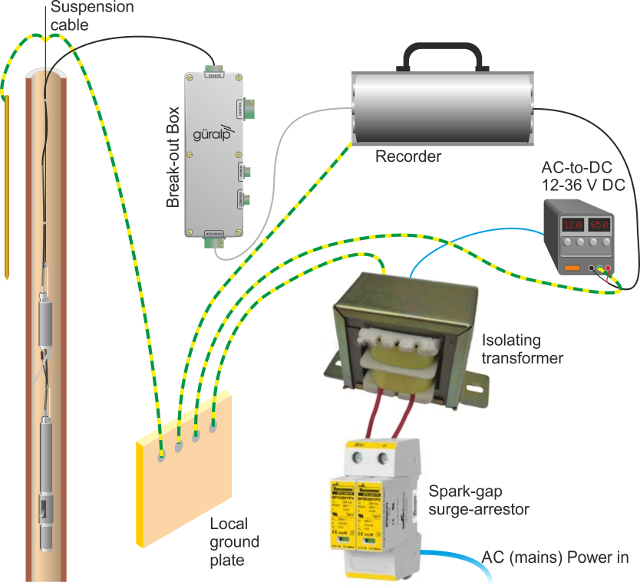 A spark-gap surge protector should also be installed on the mains side of the transformer, so that transient overvoltages are not transmitted across it. Suitable protectors are available off the shelf from several suppliers. On the sensor side, surge protection is installed as standard within all new Guralp borehole sensors and control equipment. If your surface installation includes third party electronics, digitisers, etc., you may need to install additional protection where power and data lines enter the surface enclosure. Contact Guralp Systems if you are unsure. Within the installation, a single ground point should be established, which is connected to a local ground plate. 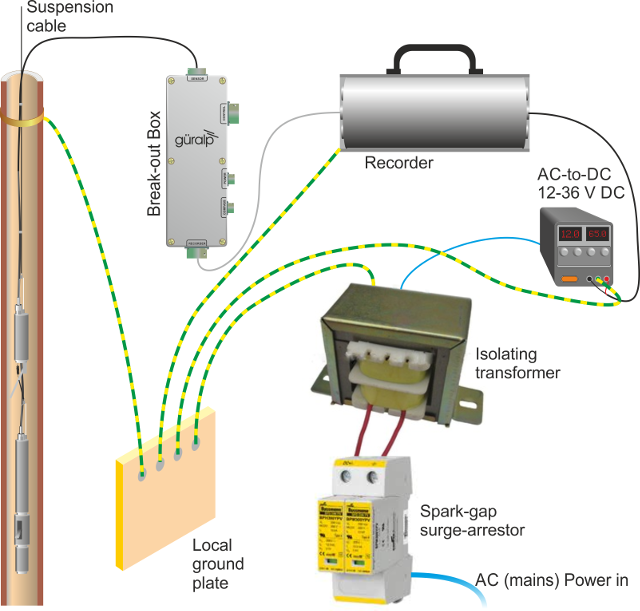 All earth lines for equipment in the installation, such as the casings of the transformers and of the sensor electronics, as well as the signal ground line from the sensor, should be connected to this plate. The best local earth point in many installations is the borehole itself. For this to work, the borehole must have a conductive casing and be situated close (<30 m) to the surface installation. In such an installation you need only connect a cable (green wire in the photograph below) from the local ground plate to the borehole casing. If the lower borehole is filled with salt water, the instrument will be adequately grounded without any further action. Fresh water is an inferior conductor. In a dry or sand-filled borehole, or one with a non-conducting casing, you will need to ensure the sonde is grounded by some other means. The best option is often to attach the sensor housing to an earth line brought out to the surface and attached to a metal stake driven into the ground nearby. 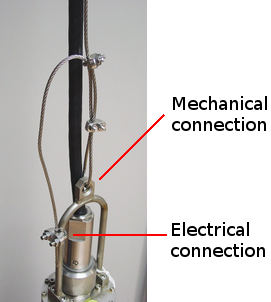 The sensor’s load bearing cable is suitable for this purpose, provided it is secured to the sensor’s lifting loop with a metallic clamp as shown below. This provides an additional firm contact between the sonde and the load-bearing cable. Installations with downhole digitisers will need similar arrangements at the top and bottom of the digitiser module, or a separate cable for this purpose. 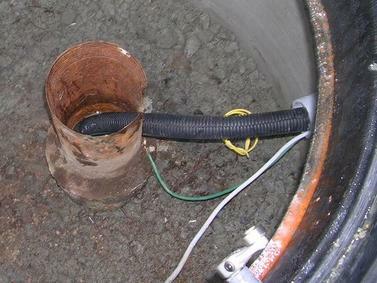 For boreholes with a metallic casing at the bottom and plastic above, we recommend connecting a cable between the sensor housing and the ground plate so that the lower borehole casing acts as the earthing point. If there is a significant distance (>30 m) between the borehole and the surface installation, the resistance of the earth cable may make it impractical to use the borehole as an earthing point. In these cases, you will have to connect the local ground plate to an earth stake near to the enclosure; any coupling between this sensor-local earth line and ground lines for other parts of the system must be minimized. Guralp sensors require a 24 V DC power supply. In most cases, this is provided by an isolating DC/DC converter installed at the surface. This converter can be earthed to the local ground plate as above. However, DC/DC converters contain sensitive electronics, which must be protected thoroughly. We recommend installing a full surge protection unit in addition to the spark gap protector. This protection is installed on the supply side of the isolator, so it must be earthed separately from the borehole installation. Otherwise, transients in the power supply will couple to the sensor. As with AC installations, if the borehole is more than around 30 m from the surface enclosure, you will need to provide a second earthing point for the local ground plate. The surface installation building, and if possible the borehole also, should be protected by lightning conductors. These should lead to ground well away from the borehole. 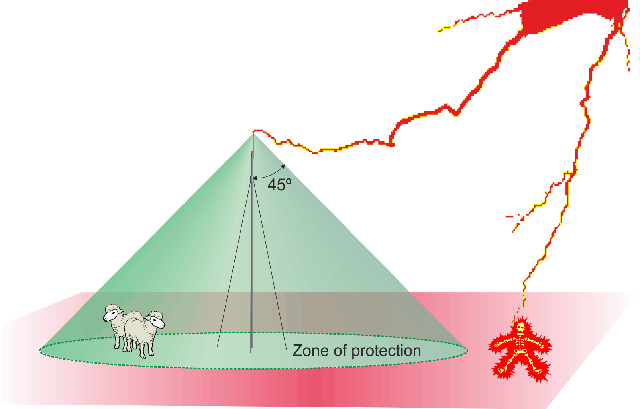 As a rule of thumb, a lightning mast provides a “zone of protection” within a 45 º cone the height of the mast.